Jim Rose and Matthew Shapiro recently traveled to Tallahassee with a delegation of local citizens for the annual Volusia Day visit to the Florida Legislature. Jim and Matthew attended sessions of both the Florida House and Senate. 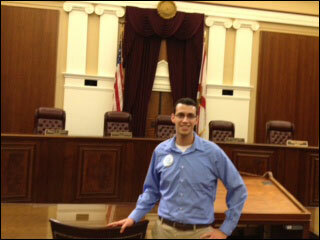 They also toured the Florida Supreme Court as shown in the picture of Matthew shown above. Paul E. Rice, Jr. Earns Martindale Hubbell AV� Preeminent? Rating.